The Entrepreneurship Foundation, Inc. is pleased to announce the Adopt-A-Class Campaign for the 2016-2017 school year. Cash contributions are encouraged as well as the donation of school supplies. 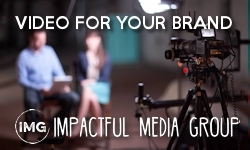 All financial contributions are tax deductible through the IRS-qualified charity, The Entrepreneurship Foundation, Inc. (EIN: 26-2948572), a 501(c)3 nonprofit organization. 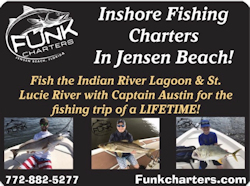 The Jensen Beach Chamber of Commerce Education Committee encourages you to contribute to this very worthwhile program. Linking businesses, classrooms, students and our educators is the goal of The Entrepreneurship Foundation Adopt-A-Class Program. 100% of all donations go directly to the teacher to purchase items that will enhance classroom learning opportunities. Donors can get special recognition through school newsletters, marquis or name displayed in the classroom adopted. Donors will also be recognized at our Chamber luncheons as a proud Adopt-A-Class sponsor. Please fill out the attached Adopt-A-Class form and return to The Entrepreneurship Foundation, Inc., PO Box 1536, Jensen Beach, FL 34958-1536. 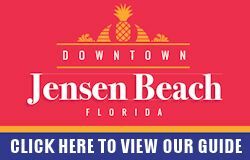 School supply donations can be dropped off at the Chamber’s Visitor Information and Business Referral Center, 1960 NE Jensen Beach Boulevard in downtown Jensen Beach. 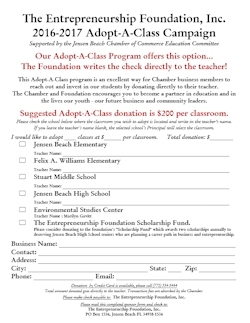 If you have any questions, or need further information about adopting a class through our program, please contact the Jensen Beach Chamber of Commerce (772) 334-3444 or info@jensenbeach.biz.